Ralph Remick Comstock was born in Sylvania, Ohio, on November 24, 1890. Maybe. The 1900 census says he was born in November 1888, in Michigan, the fourth child of farmer Clark W. Comstock and his wife, the former Sarah Little. The Comstocks lived in Whiteford, Michigan, at the time of the census. We would be tempted to assume this was not the ballplayer Ralph Comstock, except that Ralph Remick Comstock registered for the draft during the First World War and said on his registration form that he had been born on November 24 (albeit in 1887) in Lewanee County, Michigan. This is not necessarily a contradiction. Whiteford Township is in Monroe County, and Sylvania – a suburb of Toledo today – is just a couple of miles across the state line in Ohio. The Lewanee County/Monroe County line is perhaps four miles from Sylvania. It’s quite possible that the Comstocks lived on the border of the two states and that Sarah went to the hospital closest to the farm, in Sylvania. Some stories found in his Hall of Fame player file say he was born in Toledo. Comstock himself reported “Sylvania, near Ottowa Lake” in his Hall of Fame player questionnaire. He attended elementary school in Sylvania, and one year of high school as the final year of his formal education. As to the year he was born, one could ascribe deliberation to the choice of dates. Claiming 1890 instead of 1888 would make Comstock appear younger, which is usually better when it comes to contracts in baseball, and appearing to be 30 instead of 29 at the time of the war would also be better. It’s also conceivable that simple errors were made at one time or another along the way. One might think Comstock at that point would be discouraged and think of returning to the farm, but, according to the Milwaukee Journal, his “next move was one of pure brass. With $4.50 in his pocket he landed in Cincinnati one morning during the summer of 1910 [it was really 1909]. He decided to take a chance on landing a job in the Bluegrass league and boarded a train for Lexington, his total wealth being 60 cents. The Shelbyville team, then a tail-ender under Anton Kuhn, was in Lexington that day. While Comstock was seated in the lobby ruminating how long he would have to remain in jail for defrauding a hotelkeeper, if he failed to land a job, somebody clapped him on the back. It was an outfielder named Doherty, who knew Comstock back in the Lima days.”iv Shelbyville was badly in need of pitching. Doherty introduced Comstock to Kuhn, who covered his hotel bill and signed him to a contact for $60 per month. In 1910 Comstock signed with Kalamazoo, from which, despite throwing a no-hitter in spring training, he was released. Later in the year, perhaps because manager Roger Bresnahan also came from the Toledo area, Comstock was signed by the St. Louis Cardinals, getting $100 a month, but never played in a game for the team. 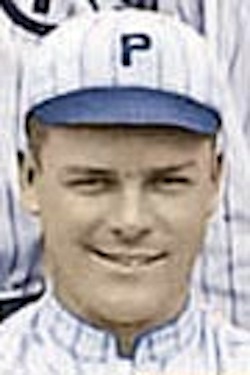 Lee Garvin, a Texas League catcher, had seen Comstock working out with the Cardinals and helped him get a job with the Oklahoma City Mets in 1911. He is also listed on the Austin Senators team and showed a 4-0 record for the two Texas League teams, and was quickly picked up by the Vicksburg Hill Billies (Cotton States League), for whom he pitched in 28 games for a 21-4 record. Hattiesburg’s Jim Bagby had one more win, but Comstock had the best winning percentage and Vicksburg won the pennant. His work naturally caught notice and he was drafted by the Chicago White Sox, and assigned to Minneapolis for 1912. In May 1914 Comstock’s contract was sold to the Providence Grays (International League). Joe Lannin, owner of the Boston Red Sox, purchased the Providence ballclub on July 31, and Comstock became property of Boston. With the 1914 Grays, the spitballer was 9-12, though at least one of the losses (a 1-0, 11-inning game at Buffalo on May 20) was a real heartbreaker. Before the 1915 season began, Comstock said that he if he did not make the Red Sox, he would not return to Providence.x He did get the opportunity to pitch in Boston and pitched for the Red Sox on April 22, then stuck with the team long enough to get into three games in 1915, and was 1-0 with a 2.00 ERA in nine innings. He was sent back to Providence on May 4 and was 15-6 with the Grays in 1915. He was sold to the Cincinnati Reds, but within two or three days was approached by representatives of the Pittsburgh Rebels and offered a tempting two-year deal. He jumped his contract and crossed over to the Federal League. It didn’t really upset Lannin; his response: “I don’t care.”xi He was 3-3 with a 3.25 ERA for Pittsburgh. Comstock pitched for the Brewers in 1916, and was 15-19 for “probably the worst team the American Association ever saw.”xiv The last-place Brewers were 54-110. Having that respectable a record with that poor a team, Comstock attracted notice. Needing some pitching, the New York Giants bought his contract on September 2, but soon traded him to Louisville. Comstock worked for Louisville (2-0) and then Birmingham (14-8, including a no-hitter against Nashville on June 15 – in which he homered) in 1917. He was employed in the offseason by the Modern Woodmen of America in Rock Island, Illinois. Though the nature of his work remains unknown, Comstock may well have worked in insurance-related matters for the fraternal benefit society. Before the 1918 season began, Comstock announced in early March that he was retiring from the game and would join with his brother in business in Toledo.xv He was enticed back to Birmingham, however. Comstock was 7-5 for the Barons in 1918 when he was purchased by the Pirates and brought to the majors for the third time. He was 5-6 for the Pirates (with a 3.00 ERA), with his last game of professional baseball on September 1, 1918 – when the major leagues ended their season due to the First World War. In May 1919 Comstock was ticketed for Birmingham again but chose to leave Organized Baseball instead. He signed to play with the Toledo Rail Lights, a semipro hometown team of some renown. The team had been runner-up in national semipro competition in 1918.xvi He pitched in 1919 and 1920 for the Toledo team, and at least one game in 1919 for the Detroit Maxwells (the team named after the automobile manufacturer) and then seems to have left off playing competitively. Comstock entered the insurance business while in Toledo and continued in the field after baseball, working for Mutual of Omaha. Ralph and Florence had a daughter, Jean, just about the time he left the Rail Lights. Comstock remained with Mutual of Omaha until his retirement. He died of Parkinson’s disease on September 13, 1966, in Toledo. In addition to the sources noted in this biography, the author also accessed Comstock’s player file and player questionnaire from the National Baseball Hall of Fame, the Encyclopedia of Minor League Baseball, Retrosheet.org, and Baseball-Reference.com. i Milwaukee Journal, April 3, 1917.
ii Sporting Life, May 9, 1908.
iii The Journal says he pitched for Mansfield, not Marion, and was 0-11, but we believe that to be incorrect. One or two other items in its account are demonstrably wrong. iv Milwaukee Journal, op. cit. v Macon Telegraph, April 11, 1913.
vi Sporting Life, November 29, 1913. The September 6 issue named McGuire. A couple of later stories said the sum was $10,000. vii Washington Post, April 7, 1914.
viii Sporting Life, February 7, 1914.
ix Washington Post, April 7, 1914.
x Sporting Life, April 3, 1915.
xi Wilkes-Barre Times, August 30, 1915.
xii Hartford Courant, April 1, 1916. The salary for 1916 and 1917 is detailed in a letter from E.W. Gwinner of the Pittsburgh Feds to August Herrmann, president of the National Baseball Commission. A copy of it is in Comstock’s player file at the Hall of Fame. xiii Christian Science Monitor, April 29, 1916.
xiv Milwaukee Journal, op. cit. xv New Orleans Times-Picayune, March 3, 1918.
xvi Flint Journal, May 27, 1919.